The Unified Communication Solution leads to Network Agnostic, Agile, Cost Effective & Customer Experience Centric Services Platform. The Sevice Layer Infrastructure is built using techniques as Switching , Home Location Register (HLR) , Authetication ( AuC) etc . The Services vary over ranges such as IN , Voice , SMS , VOIP , IM , IPTV , IMS , Presence , MMS etc . 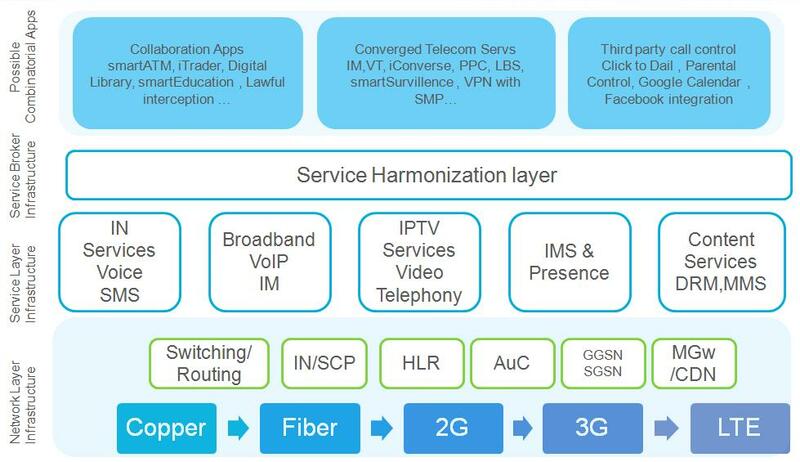 Top of this lies the Harmonization layer that performs the inter networking between different platforms and protocols . The Application Layer consists of various usecases as Enhanced Screening , Social Networking Integration , Education Trade etc .